A downtown beautification program in Clarkesville included more attractive streetscaping, murals on previously blank building walls and art displayed in what had been empty windows. In small towns, news travels fast. Town leaders began showing up a few minutes later to find the east side of Clarkesville’s historic town square engulfed in flames. Firefighters battled the blaze all night. Mayor Terry Greene stayed with them. City Councilwoman Barrie Aycock, who had been elected just months earlier, quickly realized there was little she could do and went home, where she prayed the fire would be contained. Mary Beth Horton, director of Clarkesville Main Street, the town’s downtown development association, showed up in her pajamas. She was still wearing them when day broke. City Manager Barbara Kesler arrived just as the sun was rising on Thursday. The devastation was profound. The fire began in a restaurant just off the strip and quickly jumped to the neighboring structures. Four buildings, some more than 100 years old, were destroyed. The damage would have been worse if not for the heroic efforts of Habersham County firefighters as well as a firewall that protected the buildings on the north side of the strip. Seven businesses, including three restaurants, gone. A gaping wound gouged into the middle of a charming, thriving north Georgia town. Officially, the cause of the fire remains undetermined. That was never the case for the 1,800 residents of Clarkesville, which is about an hour north of Athens. They’re quite determined. In 2011, UGA’s Carl Vinson Institute of Government, the Georgia Municipal Association and the Georgia Cities Foundation formed the Georgia Downtown Renaissance Partnership. Its mission is to help Georgia cities of all sizes and in all regions of the state focus on the importance of downtown development. Downtown development is crucial anywhere but in the hundreds of small- to medium-size towns that dot the state, it’s particularly vital. Aesthetically, downtowns are the brand of a community. They also are economic engines for the state. They fuel public pride and employ dozens, if not hundreds or thousands. The Institute of Government is an ideal partner. For 90 years, it has supported Georgia government. As a UGA public service and outreach unit, the institute’s portfolio ranges from state-mandated training for government officials to local and regional economic development, strategic planning and much more. In 2013, the Georgia Downtown Renaissance Partnership created the Renaissance Strategic Visioning & Planning, or RSVP, program to assist cities in creating a vision and work program for their downtown areas. Since then the RSVP program has assisted with downtown revitalization projects in 40 Georgia communities. Post-fire Clarkesville was an ideal client. The day after the fire, the Georgia Department of Community Affairs set up an office in Clarkesville ready to help. Clarkesville leaders, through the RSVP program, soon reached out to UGA and the Institute of Government. That brought Danny Bivins to town. Bivins, a senior public service associate, has worked for the University of Georgia since 2002 and is considered a master of downtown development and design. Clarkesville is one of more than half a dozen Georgia towns he’s partnered with through RSVP. When he got to Clarkesville, he didn’t waste any time. Over a two-month period, Bivins led 14 focus groups. One was made up of local real estate agents; another of church leaders. One was a group of high school students, and so forth. Surveys were placed in local newspapers and on websites. Every time customers went to the bank downtown or the flower shop, store owners and staff would ask them to fill out a survey. In February 2015, Bivins presented the institute’s 87-page Clarkesville Strategic Plan to a standing room-only crowd. He and his team, using input and recommendations from more than 800 Clarkesville respondents, produced in five months what would normally take a year to complete. The strategic plan offered a variety of options not only for rebuilding the square but also encompassing the whole of downtown Clarkesville. The plan is equal parts practical and ambitious. It featured artistic renderings of the new downtown strip (some including buildings as high as three stories with apartments at the top), ideas for infill construction, and even a 20-year plan for a new courthouse square. All of the art was put together by students and fellows in the UGA College of Environment and Design, under the direction of Kaitlin Messich, creative design specialist, and Clark Stancil, landscape and urban designer, both at the Institute of Government. The plan was met with near universal approval. Of course, like any multilayered project, not every idea on paper sees the light of brick and mortar. It was up to Horton to figure out how to make the good stuff happen. For more than a year, it seemed like every week Horton crossed a project off her list. Obsolete two-hour parking signs were removed and parking spaces restriped. A downtown beautification program included more attractive streetscaping, murals on previously blank building walls and art displayed in what had been empty windows. A viewing platform was built overlooking the nearby Soquee River, which flows just 100 yards from the square. A public restroom in Pitts Park was cleaned up and repainted. The linchpin to the work, of course, was the square. After trying to work with owners of the damaged properties to no avail, the city of Clarkesville simply bought the whole area. That gave town leaders creative control over what was built. With Bivins coming to town at regular intervals to consult and offer further ideas for moving forward, ground finally broke on the square on April 6, 2016. After a fire in Clarkesville, UGA helped the town rebuild. 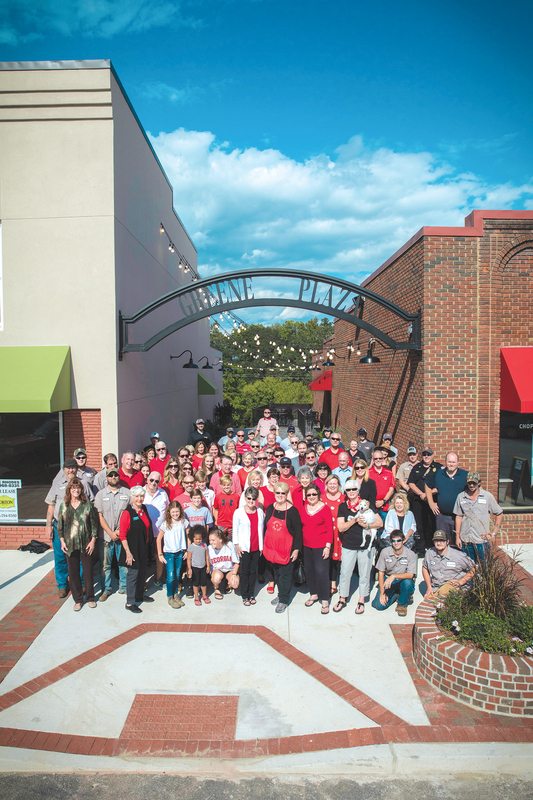 The renewed East Clarkesville Square features a plaza named for the late Mayor Greene. One year to the day of the groundbreaking, Aycock, Kesler and Horton helped cut a green ribbon officially dedicating the renewed East Clarkesville Square. Including building purchases, the entire project cost $3 million, and 40 percent of that figure was raised from grants. At its center is a plaza named for the late Mayor Greene. The lamp-lined space doesn’t appear in any of the Institute of Government’s renderings; it’s a product of the Clarkesville team’s creativity and ingenuity. The remaining walls wouldn’t accommodate an additional building, so Clarkesville improvised and opened the whole thing up. It was an inspired choice, rooted in the confidence sown by the institute’s philosophy: The community has the solutions. The ribbon cutting was merely one step in a process that is in a constant state of progress. The streetscape keeps improving. Recommended plans for downtown lodging and a community event space continue to move forward. The square now hosts a weekly farmers market, the previously underused Habersham Community Theatre has a full marquee, and art and music events are commonplace. Bivins doesn’t spend much time in Clarkesville now, but the institute’s strategic plan is always within arm’s reach.